Geeking Out For Halloween: Behold The R2-D2 Jack-O'-Lantern : All Tech Considered All Tech Considered takes an in-depth look at what goes into carving the most seasonal of geek crafts, an R2-D2 jack-o'-lantern, with pumpkin sculptor Noel Dickover. Over the last nine months I've gotten to know Noel Dickover, one of the founders of CrisisCommons, a group of volunteers I'm involved in that pools its tech skills to help respond to natural disasters. After meeting him in person, I started following him on Twitter, where his avatar seems to show him hugging a large pumpkin. For months I couldn't figured out what he was doing. It turns out he's not hugging that pumpkin; he's carving it. No, that doesn't even do it justice; he's sculpting it. And this weekend, he sculpted a whopper of a pumpkin - a fully rendered R2-D2 jack-o'-lantern. For Halloween and Star Wars geeks alike, it's truly a harmonic convergence of awesomeness, so I decided to chat with Noel about the technical work that went into creating it. How long did it take you to carve R2-D2? It took somewhere between 10-11 hours. I started at 10:00 on Saturday morning and got done just after 10:00 that night, but taking in account eating and so forth, that's my estimate. What goes into planning one of your pumpkins? There's a difference between carving a pattern on a pumpkin, and a pumpkin sculpt. 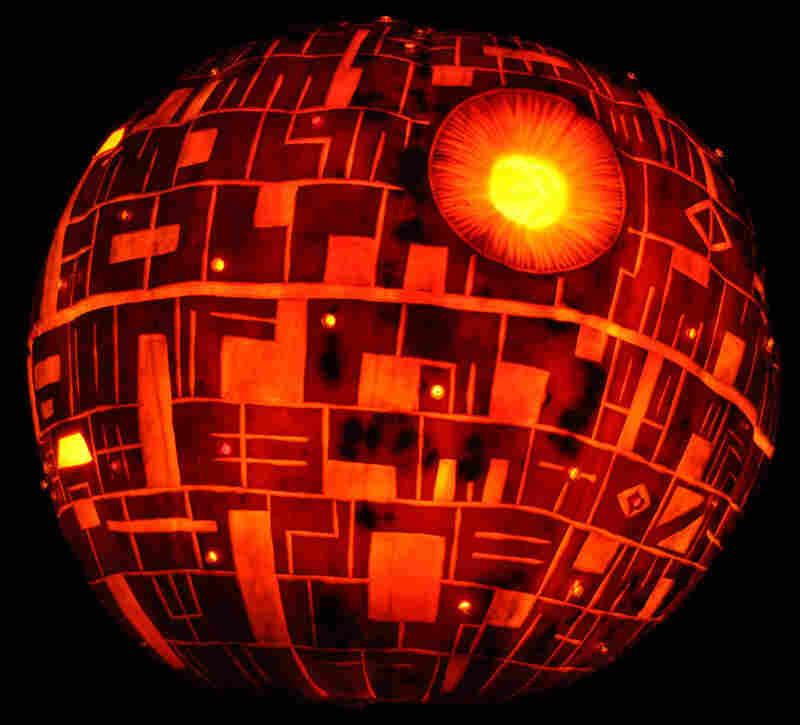 In the case of R2-D2, or the Deathstar, for instance, the pumpkin "is" the object, not just a portrait. So in thinking about carving R2-D2, I absolutely had to have a fairly tall, completely cylindrical looking pumpkin. I found one that weighed in at right around 40 lbs. Without this, there's no way I could have gotten the detail I was looking for. The other issue is whether the pumpkin has a smooth surface or whether it has a "grooved" surface. Grooved lines on R2-D2 obviously wouldn't work. Finally, for R2-D2, because I didn't have a pattern, I needed to have pictures of anatomically accurate R2-D2 pictures. I found these both with the Weta Sideshow R2-D2 sculpture and with some videos of fully functional R2-D2 units from the R2-D2 Maker's group. 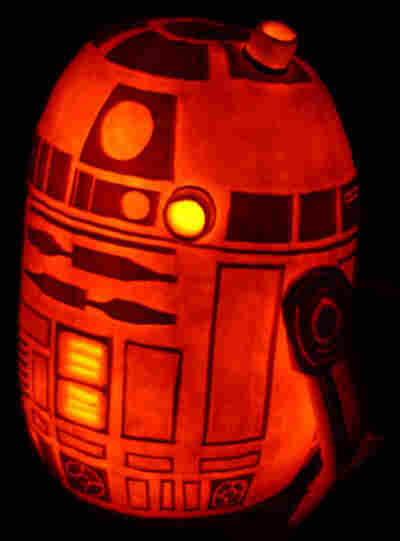 Then its a matter of taking the "real" R2-D2 and transposing it to the pumpkin you have. In my case, I might have made the top a tad to big, but overall, I was able to get all the elements into the pumpkin. (I did make a mistake by having only 5 shapes circling around the top instead of 6, and perhaps a few other things like making the back a bit too wide, but all in all it was fairly decent for winging it). I also used a sewing tape measure to keep certain distances internally consistent. Incidentally, for portrait carves, where I carve a pattern on the pumpkin, some of them might take me a good 10-15 hours to make the pattern from a picture. For some pumpkins, I've spent well over 30 hours in total. For instance, on fairly long one was my Mickey-Chernabog carve [from the animated musical Fantasia]. I started with a coffee-cup, which I hand-scanned 8 times and spliced bits of the scans into Photoshop, and then spent another 12 hours with the pattern, before giving up on completing it, and then spent another 15 hours carving it. What did you use for R2-D2's legs? I had bought a really nice large pumpkin that started to rot on the top. I cut off the top of that pumpkin and used the rest of it for "parts." So the three scopes that stick out of R2-D2 came off of that - it took me a number of failed attempts to make the scopes - as well as the two leg pieces. I made the legs fairly thin, but left a long "socket" that could fit through a hole on the side of R2-D2. The scopes were glued on with Krazy Glue, and I used orange modeling clay at the base to mimic the black rings the real R2 has. What else do you have in the works this month? I've already done a fairy and a flying eye. I'm also planning to do a Borg Cube (well, three sides, anyways), which I have a 50-lb pumpkin for (that might be a disaster - who knows! ), a Hellraiser Pinhead sculpt with lightbright pins sticking out, some dragons from How to Train your Dragon and Avatar, Neytiri from Avatar, the Mad Hatter and a variety of other things. I provide the patterns I make to carve the pumpkins to anyone interested.